Follow the evolution of Justin Bieber's style throughout his career from street performer to Christian pop star. Justin Bieber is a Canadian singer and songwriter. He was born in 1994 in Canada, to single Christian mother Pattie Mallette. Bieber took second place in a local talent competition at a young age. 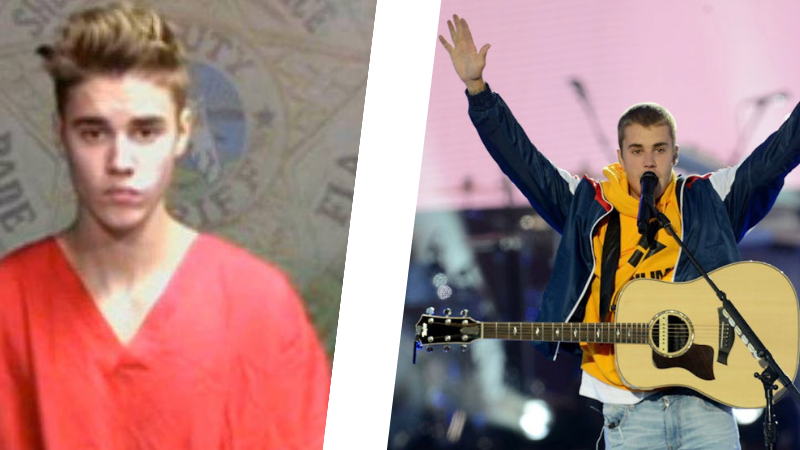 After his mother posted YouTube clips of her young boy performing on the streets, Bieber went from an unknown, untrained singer to a global superstar with a big-time record deal with Usher within two years. Bieber went on to become the first solo artist to have four singles enter the Top 40 before the release of a debut album. His 2009 album My World has gone platinum in several countries. He has since stepped out as an outspoken Christian and uses his fame and influence to share Jesus with the world through social media. Keep reading below for a look back through Justin Bieber’s journey, and his many styles, over the last nine years, from street singer to Christian celebrity. Here’s Justin Bieber as a toddler. It was on the streets where Justin was discovered by Scooter Braun, who is now his manager. Shortly after being discovered he was signed to a record deal by Usher on Island Def Jam Records. He was only 15 years old at the time! He became an immediate teen heart throb and pop music sensation. He became famous for his trademark hairstyle, that evoked the 90’s boy band era style. Just look at that cut! Bieber was constantly brushing the hair out of his eyes, adding to the “teen heartthrob” aesthetic. By 2011, Justin was approaching 2017 and his look starts to mature along with his music. He cut his hair a bit shorter and and started to change his style dramatically, emerging as an older and more mature Bieber. His hairstyle began to evolve along with his music career. Here we see the entrance of the spiky look, something new for the Biebs. By late 2011, and around the time Justin dropped his Christmas album, we see a completely new and reborn Biebs! For his attendance of the 2011 American Music Awards, we see a polished and distinguished look for the first time in Bieber’s public life. By 2012 things start to change in Justin’s style, even more dramatically. Gone are the cropped boy band looks of his early career. Is he channeling his inner Elvis? Eventually he shaves the sides, eliminating his trademark swoop look forever. And by 2013 he started to invest in extensive tattoo work. After a public hiatus from the spotlight, Biebs returned in 2014 with a sharp new look and a neck tattoo that says “patience”. To the dismay of many of his fans who may not like tattoos, Justin continues to get frequent tattoo work done to this day. 2014 also saw the introduction of a “bearded” Justin Bieber. Justin’s style evolves quite a bit from 2014 to 2015. Here we see a longer and slicked back look for his Comedy Central Roast in March of 2015. He returned to his more traditional cut with a lighter color for the Met Gala in May 2015. By late 2015, everything starts to change. He drops his new album “Purpose” in late 2015, and his hairstyle changes dramatically. Here we see a new cut with a really long top and shaved sides, complimented by a platinum blonde coloring. Justin introduced this style for his “Purpose” tour. As the year went on, we see a lot of different styles from Justin with longer lengths. He even sports a man bun for a brief period! By mid-2016, all the long styles are gone. Justin emerged with a pierced nose and shaved head in May of 2016. He kept his head shaved for a quite a bit, but towards the end of 2016 he started to grow it out again. It even looked like he was returning to the iconic “Biebs” swoop look! More recently, we have seen an even more dramatic change in Justin’s look and lifestyle. 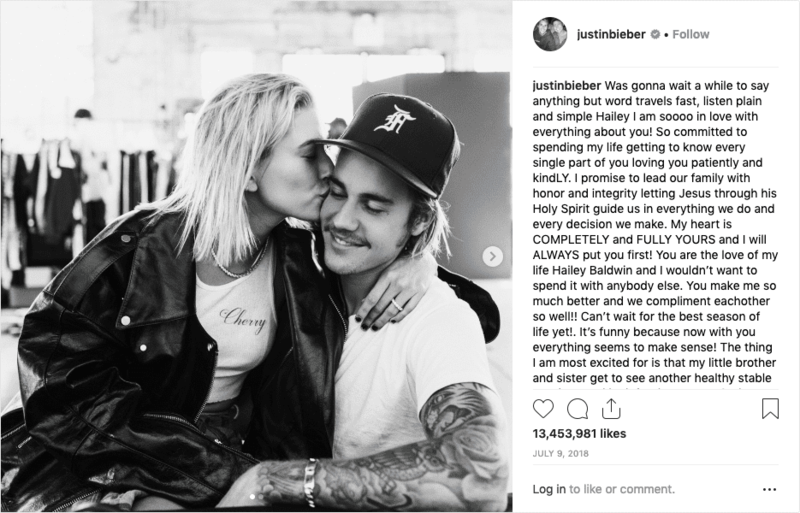 In 2018, Justin made headlines when he and Haley Baldwin got married out of the blue! It wasn’t exactly out of the blue, but it sure seemed like it. they first met in 2009. They became close in 2011. But they weren’t dating yet, as Justin was in a relationship with Selena Gomez at the time. Fast forward to 2018 and they were inseparable, attending church together, and seen everywhere together in public. Today Justin Bieber and Haley Baldwin are married and they are openly devoting their relationship to Jesus. Just look at this heart felt love letter Justin wrote to his new bride on Instagram, where he gives all the glory and praise to Jesus!